I've never really associated the orange cream flavor with Halloween until visiting Disneyland this month and having their orange twist soft serve. It's sweet, creamy and reminds me of being a kid again. This potion is inspired by those flavors but is a bit more grown up (i.e. 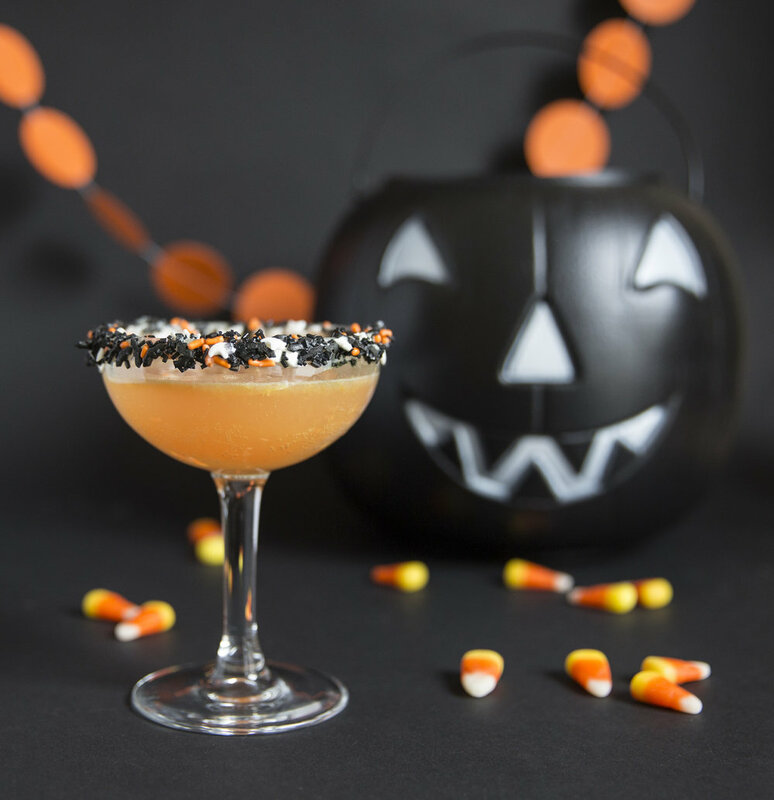 booze) - This drink would be perfect to serve at a Halloween party. By the way, have I mentioned how excited I am for Halloween? You can sub whipped cream flavored vodka and club soda for a much less sweet alternative. Do ahead: Gently melt a small amount of white chocolate in a sauce pan. Once smooth remove from heat and dip the rim of your glass into the chocolate. Fill a shallow bowl with sprinkles and sanding sugar. Dip your glass into the bowl, making sure that the chocolate gets covered with decorations, then refrigerate for a few minutes upside down. This will insure that your sprinkles aren't sliding down your glass when you go to stand it up. In another glass or pitcher juice one half to one blood orange depending on size. Remove any seeds or large pieces of pulp. Gently mix in 1 oz. vodka, a splash of milk for color and cream soda to taste. Once your glass rim has hardened, carefully pour in your mixture. If you wet the sprinkles they may change the color of your drink which would be spooky in a bad way. Enjoy your drink while saying cheesy, overused lines like "I'm here for the boos."